Let me ask a question. Do you have salad with your Thanksgiving meal? My mother used to prepare a garden salad for our dinner almost every night that I can remember. Nothing too fancy, romaine lettuce, cucumbers and tomatoes always tossed with Ken’s Italian dressing, the clanking of the spoons against the side of the salad bowl signifying that dinner was about to be served. Yet on Thanksgiving when it was her turn to cook, she never made a salad. Recently, I was at a dinner party with a large group. The conversation migrated to the upcoming Thanksgiving holiday and the many side dishes that might be served including large platters of family disfunction and bowls of lethal discussions about politics! We also discussed salad, its appearance on the Thanksgiving table, and what exactly constitutes a salad. For me, a salad is primarily vegetable based, unless its one of the stellar fruit salads my friend Sally or my college friend, Sue happen to make, prompting me to question why I never do the same (lazy!). Which leads me back to my mother. Our Thanksgivings were often a marriage of Armenian foods like Pilaf and Fassoulia with more traditional American dishes like squash and stuffing. But truth be told, it wouldn’t be a holiday without my mother’s Bing Cherry Jello Mold, something I loved to hate, but grew to appreciate over time. I know it sounds crazy and it might be one of the only processed foods to ever appear on her table, but when I think of the holidays at our house, this pink and red sweet side was always there, served in a decorative ring mold that made it look – if you can say this about jello – beautiful. Bing cherries lined the bottom of the mold and were topped with a layer of cherry jello that was mixed with crushed pineapple and allowed to set. More cherry jello was whipped with cream cheese and heavy cream and added to the mold and the whole thing was left to set up in the fridge. I can only imagine the stress of the unmolding – something I never bore witness to as it turns out. As a youngster, I never even took a bite of the stuff. I liked jello but the mold was a no thank you. Over time, I ventured into wiggly territory and began including it on my plate, but always still picking around the big bing cherry. Today, if I could sit down at the table with my mother on Thanksgiving, I would eat the whole darn thing. Did she consider it a salad on her holiday table? Alas, I will never know. This week, I am sharing a recipe from Ina Garten’s latest cookbook, Cooking for Jeffrey that was recently released. I had a small luncheon for a friend’s big birthday and decided to include the recipe in my menu. 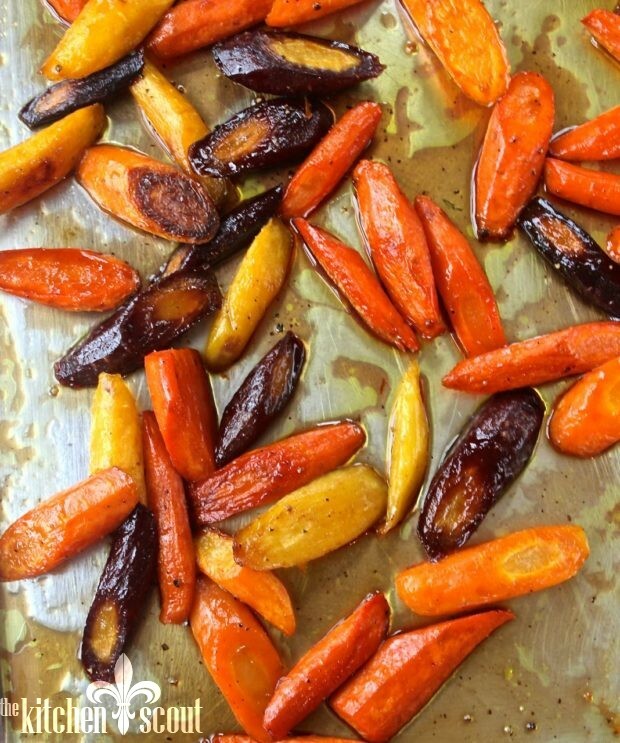 Carrots (I used multi color) are tossed with maple syrup and roasted to enhance their sweetness and caramelize. A dressing of sherry vinegar, olive oil and garlic is prepared. 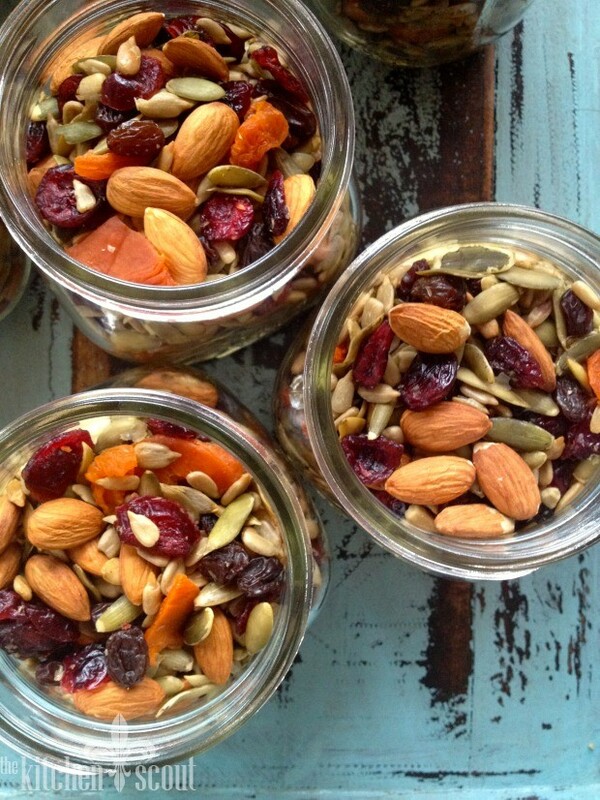 Dried cranberries are plumped in orange juice. 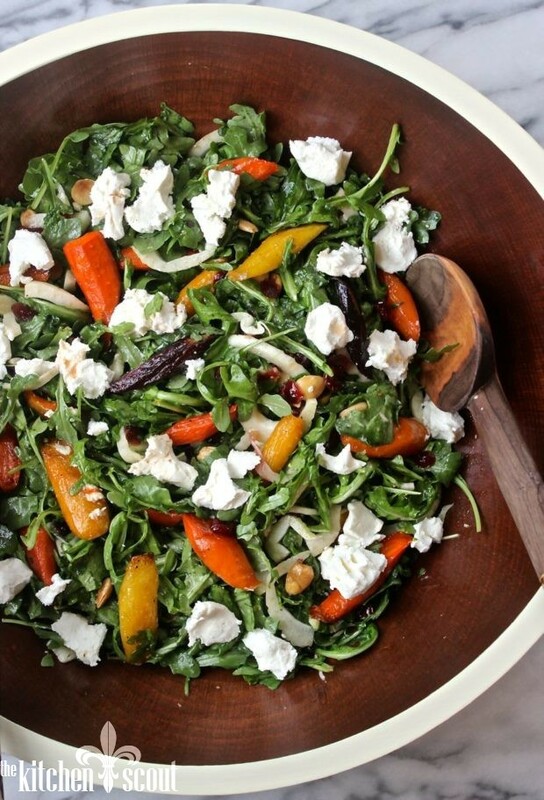 Arugula is tossed with the cranberries, carrots, goat cheese and some salty Marcona almonds. I added fresh fennel because I love it and thought it would add just a little more dimension to the salad. I might even add a little red onion to the dish next time, or some Dijon to the dressing. I also changed one of Ina’s suggestions – she says to add in all of the soaking liquid from the cranberries to the greens, but I feared this would make the salad too wet. I only added a drizzle. My suspicions were confirmed by a friend who said she had made the salad just a few days prior to the luncheon and this was her experience. 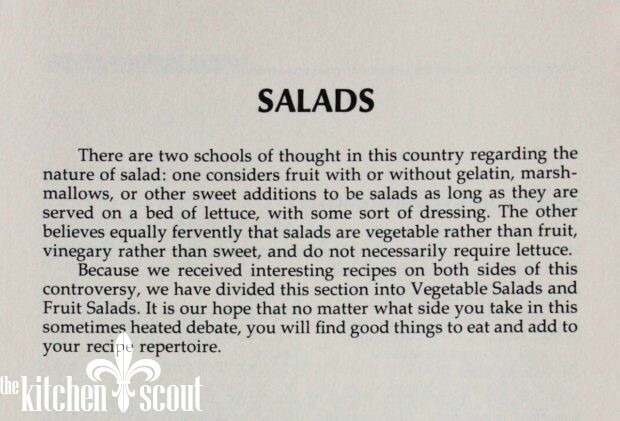 If you are a “salad at Thanksgiving” person (and do not care for jello, ha ha), then this would make a lovely addition to the table. Everyone loved it – especially the carrots which I would venture to say could be served just as a side dish if you want with an extra sprinkle of salt. While it was my mother’s apple pies and cakes that were truly her signature dishes, her jello mold does hold a place of nostalgia despite its disappearance from our holiday table decades ago. It may be fun to make a little version of it next week, if only for a little chuckle and one of those indescribable moments where someone gone has come home for just a bit. The Kitchen Scout will be on hiatus next week so I will see you on December 2nd. Happy Thanksgiving to everyone! First time using my new, mega salad bowl from Sherwood Forest Design. 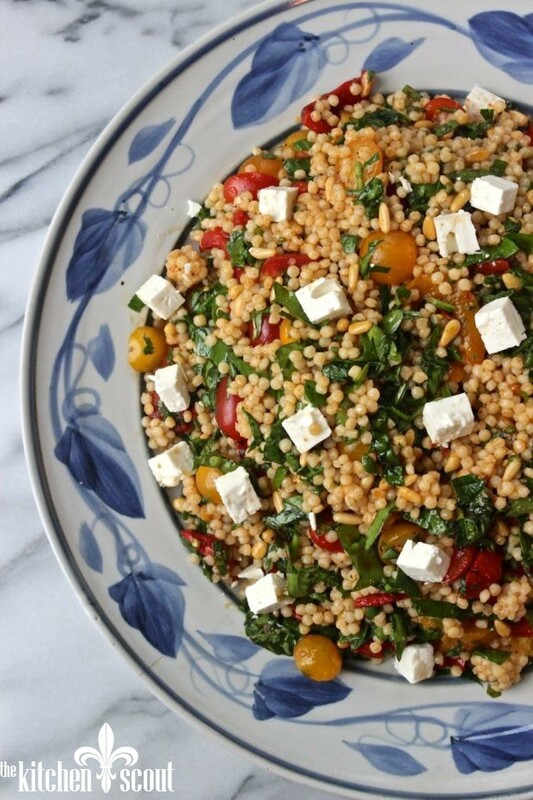 I have one of their smaller bowls, and a tray of theirs that I love but I have been searching for an oversized salad bowl for big groups and I found it this summer. The bottom of the bowl is the same creamy white. Love! This recipe is from Cooking for Jeffrey by Ina Garten. I have adapted it just slightly by adding one of my favorites, fresh fennel. I've also adjusted a few steps from the original. It's a lovely fall or winter salad, and I would also suggest that you could serve the maple roasted carrots on their own as a side dish if you double the recipe and finish them off with a little more salt and pepper. Yum. Trim and scrub the carrots. If the carrots are more than 1 inch in diameter, cut them in half lengthwise. 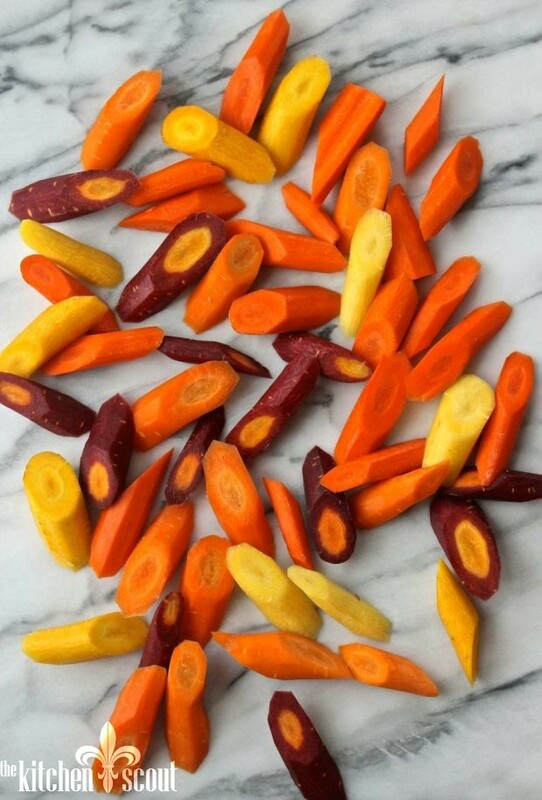 Cut the carrots in large diagonal slices 1 inch wide by 2 inches long (they will shrink when they roast) and place in a medium bowl with 1/4 cup of olive oil, 1 teaspoon salt, and 1/2 teaspoon pepper. Toss well and transfer to two sheet pans. (If you use just one, they'll steam instead of roasting.) Roast for 20 minutes, tossing once, until the carrots are tender. Using a slotted spoon, transfer all the carrots to one of the sheet pans. Add the maple syrup, toss, and roast for 10 to 15 minutes, until the edges are caramelized. Watch them carefully! Toss with a metal spatula and set aside for 10 minutes. Meanwhile, combine the cranberries and orange juice in a small saucepan, bring to a simmer, then set aside for 10 minutes. Drain, reserving the liquid. In a small bowl, combine the vinegar, garlic, and 1/2 teaspoon salt. Whisk in 3 tablespoons of olive oil. 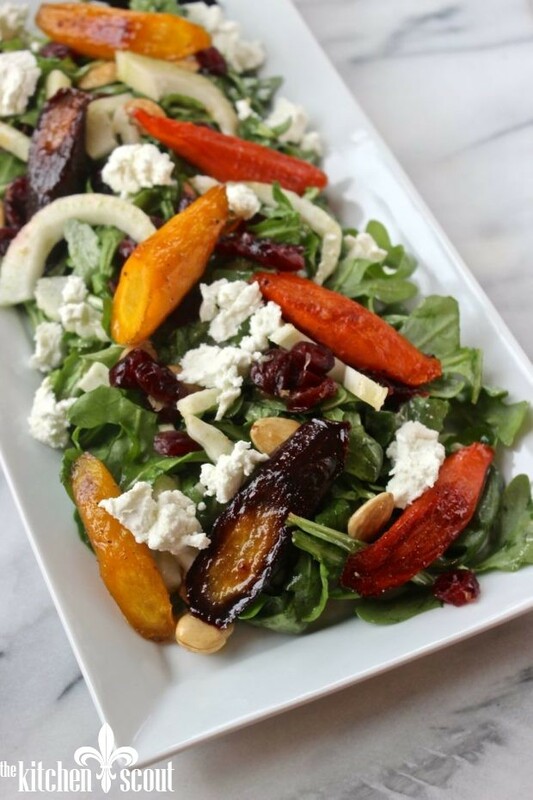 Place the arugula in a large bowl and add the carrots, drained cranberries, fennel, almonds, and the vinaigrette. Add just a drizzle of the reserved cranberry liquid. Toss with large spoons, add goat cheese distributing evenly. Sprinkle with salt, and serve at room temperature. This looks terrific. Do I dare send it to our friend who offered to bring the salad for Thanksgiving dinner? This looks yummy – will make it next week when Emily is home! Val, I made this salad last Sunday for a group of high school students we had over and it was a huge hit. Marc, who doesn’t normally like carrots loved this salad. I would agree that you don’t need to add all the juice from the cranberries and like the idea of adding a little Dijon to the dressing. Not only is this a delicious salad, it presents beautifully on a large platter.